Sorry to post this so late. Passover is almost over and I forgot to post my card! This card was made using stamps from A Creative Journey with Melissa. This set is called Hannukah and Celebrations and is very appropriately named so. It's sometimes hard to find stamps for Jewish holidays. This set is perfect as it encompasses all the major holidays. It's always good to keep a stamp set like this in your arsenal as you never know when you'll need it! Go to A Creative Time with Melissa and see what other beautiful stamps she has. A very simple card to do that took about 10 minutes. I embossed the Menorah and the greeting. I used a MS punch at the bottom of the card and Queen & Co. pearls as embellishments. The ribbon was in my stash. Just remember you don't have to get all fancy to make a card. It's the thought that counts and keeps us crafters out of trouble when making them! Enjoy and to those that celebrate, I hope you are having a Happy Passover! Please remember I still have a Giveaway! I will be giving away a Marion Smith Bloom Impressions tool! Just to this blog post link and comment what would you like me to carry in my store! It is a $25 value and will be one of the most talked about tools for making flowers ever! Winner will be announced on May 1st.....good luck!!! 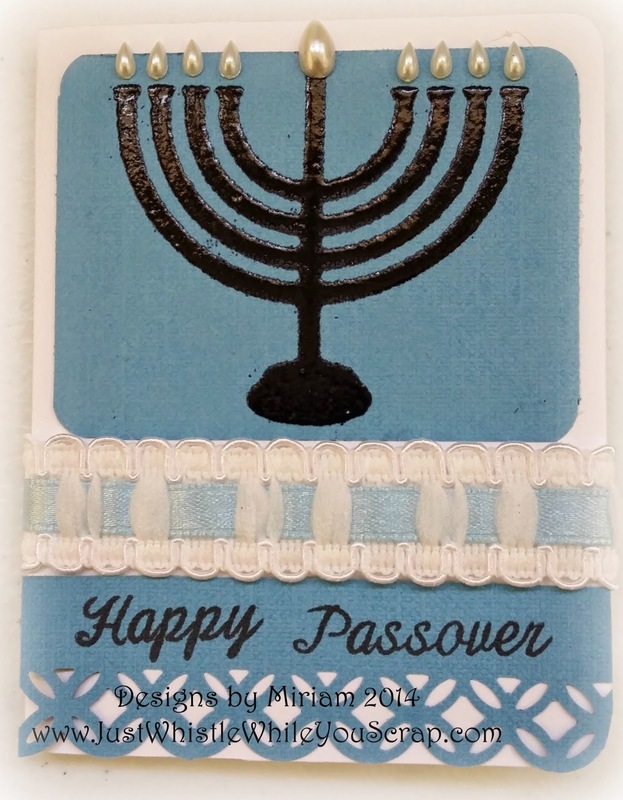 Labels: 10 minute cards, AcreativetimewithMelissa, embossing, Hannukah, MS punches, pearls, Queen & Co.